Hello foodies! After a long time, I’m feeling better and able to rich you, because of my illness! Hope, now the journey will be smooth and healthy……..
How are you? Are you enjoying the winter? It is my favorite season. 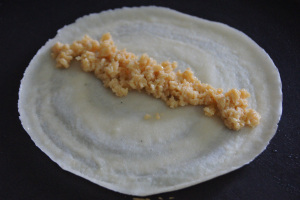 Today, I’m going to share a recipe, which is made in a Bengali Festival, celebrated in the winter. Also, we make it in the Holi, too! Hope you like it…. In a saute pan, mix the Coconut and sugar/ Jaggery together and then place the pan over a simmering flame stirring continuously. Add the kheer/ condenced milk and Cardamom Powder, and keep stirring till the mixture is moist and turns a little brown and sticky. The consistency should be granular. Take out of the flame and keep aside. Mix all the dry ingredients in a bowl and add in the milk to form a medium thin mix with constant stirring to avoid lump formation. The batter should be thin, smooth and free flowing. Let it rest for 1 hour or a minimum of ½ hour. To make the pancake heat a non-stick flat frying pan. Add in a bit of ghee/ oil and let heat. 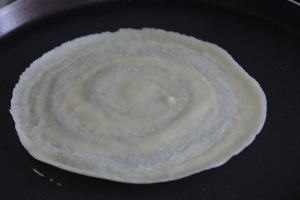 Then pour a medium ladle full of batter steadily and spread it evenly onto the pan moving the batter with back of the ladle (This has to be done quickly before the batter sets). You will know the pancake is done when the top is all set. That should take about 3-4 minutes per piece. Put in a bit of filling in the center and fold both the ends. If you want to apply some more ghee this is when you can do it. 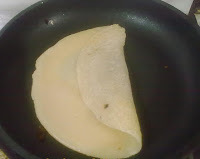 The pancake should not be very red but just well done and slightly reddish or it can be left white as well. * This will keep in the refrigerator for a week; not that last even that day. Add a teaspoon of canola oil in the water before boiling the rice to separate each grain after cooking. Well, now the time to leave friends! Please share your views about my blog; it’s very important to me. Also your likes and dislikes or if you want anything to know, please share here. We are going to start the first Giveaway very soon! Keep watching the blog and page. Till then….. bye….take care……Namaskar. At first you are welcome back.Pray you remain healthy and available to food lovers.This recipe is tempting motivating to try it.